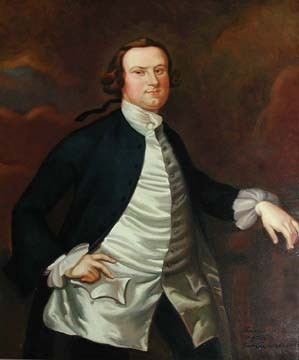 Daniel Carroll II, also known as Daniel Carroll of Rock Creek, was born in 1730 to a Catholic landowning family in Upper Marlboro, Maryland, Daniel Carroll and Eleanor Darnall. Both Daniel and his brother John were sent to France to attend the college of St. Omer, founded in the late 1500s and run by the Jesuits. Daniel Carroll was a planter and landowner in the area called Rock Creek – now known as Forest Glen – just north of present day District of Columbia. He married Eleanor Carroll – who descended from another Carroll family. They had two children: Daniel Carroll III and Mary Carroll. After the American Revolution, Daniel, a Catholic, was able to vote and to serve in public office. From about 1777 to 1781 Daniel was a member of the Maryland Council of State. In 1781 he became a delegate to the Continental Congress and signed the Articles of Confederation. From 1782 to 1791 he was a member of Maryland state senate, serving as president in 1787 and 1788. Daniel was involved in the Patowmack Company, George Washington’s project to make the Potomac River navigable further west for commerce and trade. He was a delegate from Maryland to the Constitutional Convention in 1787, serving on a Committee of Eleven which dealt with interstate trade and navigation. When it was suggested that the President (executive branch) should be elected by the Congress (legislative branch), Carroll, seconded by James Wilson, moved that the words "by the legislature" be replaced with "by the people." Along with thirty-eight others, he signed his name to the document on September 17. Maryland was the seventh state to ratify. Daniel also pushed for the Bill of Rights and the Tenth Admendment in which he wanted that powers not delegated to the Constitution be reserved for the states and the people. In 1789 Daniel was elected to the U.S. House of Representatives where he served until 1791. He was appointed by George Washington to be one of the three commissioners to survey and lay out the District of Columbia according to the requirements set out by Congress. "On May 7, died at Rock Creek, Daniel Carroll, Esq., a gentleman of unbounded philanthropy, and possessed of all the esteem of all who had the pleasure of his acquaintance." 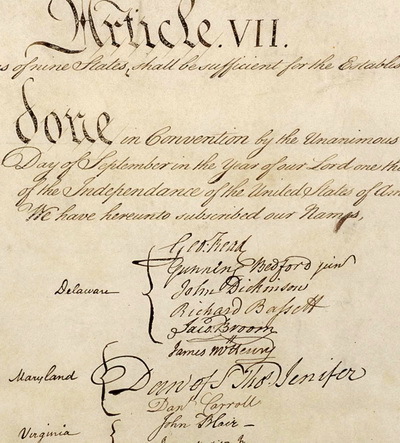 Portion of the signatures on the Constitution shows Danl Carroll as one of the delegates from Maryland. Photographs and web page content,Copyright © 2002-2009, Anne Field, all rights reserved.